Once you know the basics of Tendernews search, you might want to try Advanced Search, which offers numerous options for making your searches more precise and getting more useful results. 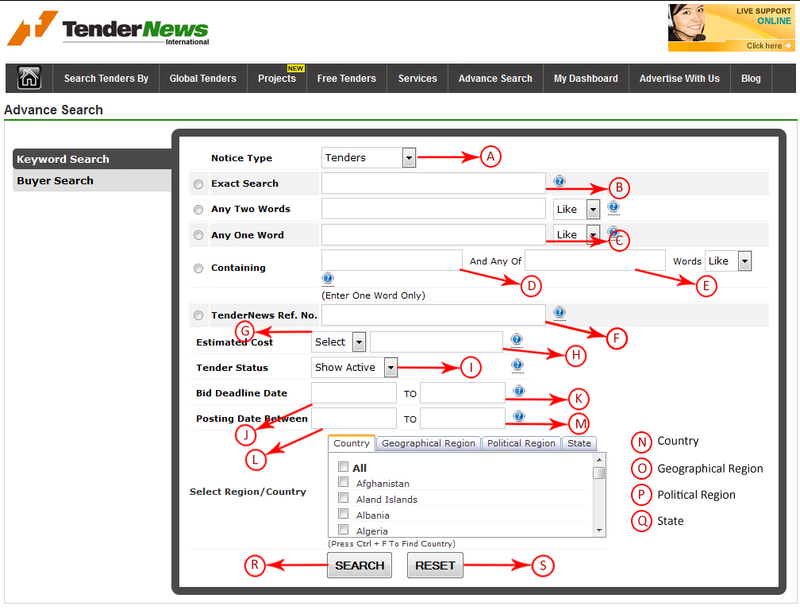 You can reach this page by clicking the " Advanced Search " link on the Tendernews home page. That contain any two search Keywords you type in. That contain at least one of the words (Keyword) you type in . That contains the combination of first keyword with any or all typed words in containing search box. A Exact Search : Try to use exact search when you want tenders related to the exact keyword that you type in the Exact Search Box. Let us have a look at search result for Exact Search. 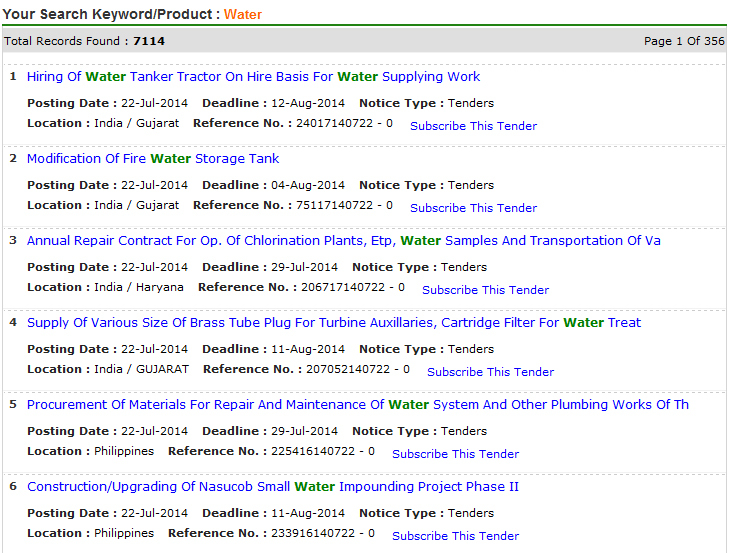 Search for SUBSTATION will list tenders that maches the SUBSTATION in the detail column. B Any Two Words Search: Try to use Any Two Words Search when you want tenders related to any two words that you type in Any Two Word Search Box. Let us have a look at search result for Any Two Word Search. Search for WATER TREATMENT PLANT will list tenders that contains WATER TREATMENT or WATER PLANT or TREATMENT PLANT in the detail column. C Any One Word Search : Try to use Any One Word Search when you want tenders related to any one words that you type in Any One Word Seach Box. Let us have a look at search result for Any One Word Search. Search for WATER TREATMENT PLANT will list tenders that matches any one word in the detail column, It will Reflect tenders related to WATER or TREATMENT or PLANT. D Containing Word Search : Try to use Containing word when you want tenders related to combination of word from first Search Box with Any word of the second search box. Let us have a look at search result for Containing Word Search. Search for FIRE FIGHT ALARM EXTINGUISHER SYSTEM will list tenders that matches like FIRE FIGHT or FIRE ALARM or FIRE EXTINGUISHER or FIRE SYSTEM. E STATE : This will activated when you select tender type as INDIAN TENDERS, this option enables you to select State Name from where you want tenders. F COUNTRY : This will activated when you select tender type as GLOBAL TENDERS, this option enables you to select Country Name from where you want tenders. G TENDER TYPE : This option enables you to choose the type of tender you want to search, it may be Indian Domestic Tenders or Global Tenders or Both (Indian Domestic + Global Tenders). H GO : This button is used to start search.